GET YOUR OUTDOOR BBQ ON, ASIAN STYLE! In the United States, BBQ is a staple for outdoor fun and summer time memories. Usually, edible faire consists of hot dogs, hamburgers, ribs, skewers, and all kinds of delightful condiments. However, if you're looking to get a little adventurous on your next backyard get together, you might want to try it Asian style. Nothing beats a delicious outdoor stir-fry just like they do in Thailand. So, now that we've got your attention, check out the best outdoor wok burners on the market for your next summer time get together. If you've ever worked with a wok before, what is the first thing that comes to mind that can be extremely obtrusive in the kitchen? You got it, smoke! When cooking at very high heats, smoke can become blinding and hazardous to the chef. Also, oil splatter can be a nuisance and extremely difficult to clean. 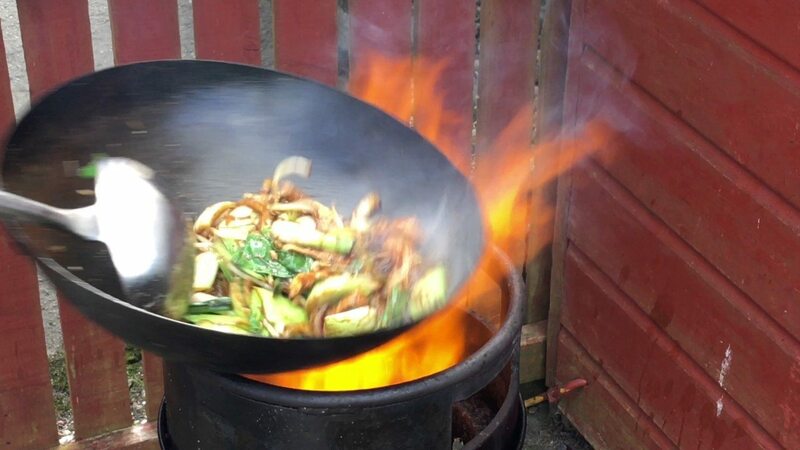 Generally, wok cooking will require to cook at extremely high heats that can only be executed with a 54,000 BTU and up. Cooking vegetables in a wok at any low temperature will cause your foods to lose it's crunch and become saturated in grease. 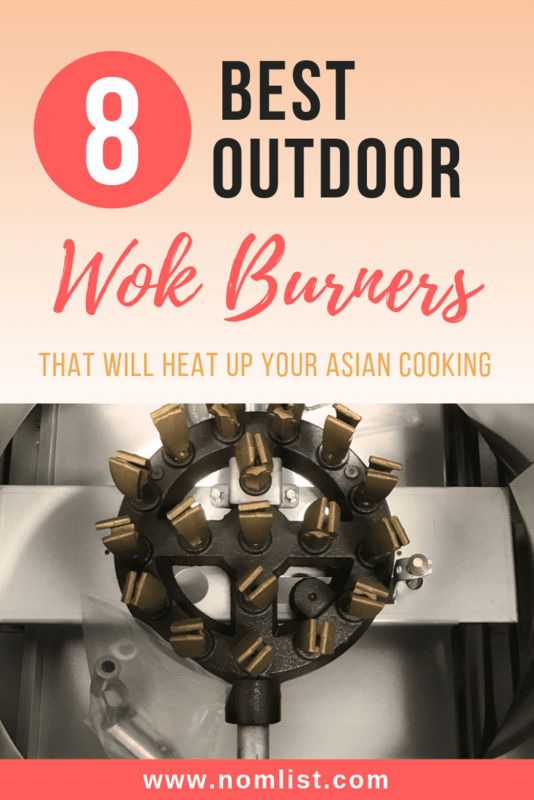 We carefully scoured the market and found a few important factors that will help you choose the best outdoor wok burners for your next outdoor Asian cooking escapade. If you're looking for a great all-in-one starter package for your outdoor wokking, this is the perfect set for you. Not only does this set include an incredible burner, it also comes with a high quality 22" carbon steel wok, wok spoon, and spatula. So, no need to make an extra trip to the Asian cookware store to get started on some of your favorite Asian dishes you've been dreaming about! When it comes to power, this bad-boy wok delivers 65,000 BTU, allowing you to stir-fry, deep fry, and boil all kinds of Asian cuisines. Also, this incredible wok burner boasts that it burns 75% cleaner that it's competitors. This allows for a cleaner cook and less processed oily flavors in the end result of the food. 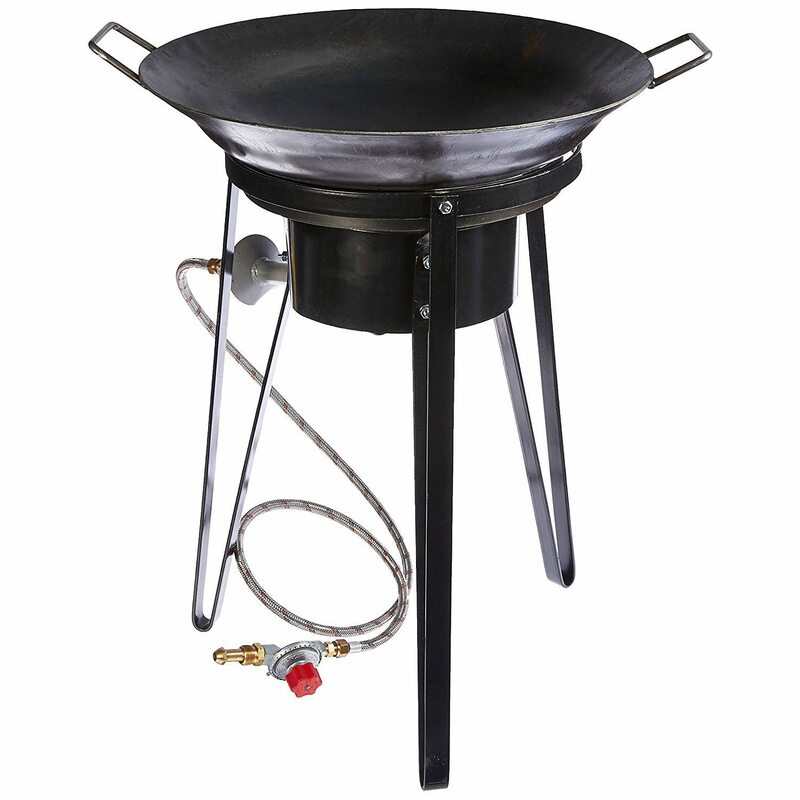 On top of that, this wok burner works with a standard 20 lb propane tank, making refueling a breeze. In the end, we feel this is the perfect set to get you starting on woking out doors. The adjustable legs, portability, high burning capacity, and extra features are perfect for any beginner outdoor wok chef. Finally, a burner that's not only a bargain but also a high quality product and package. 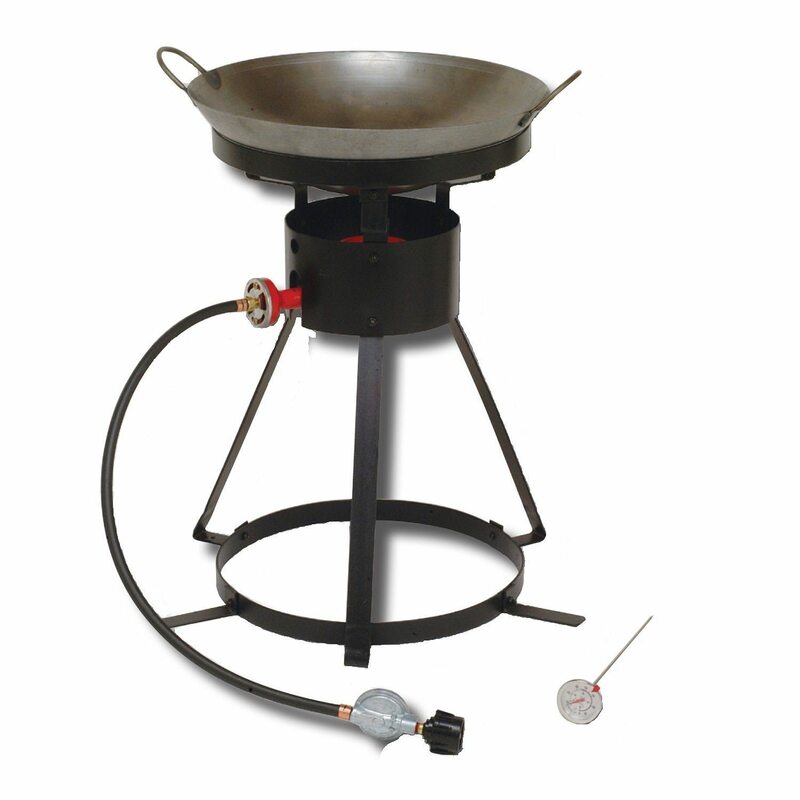 If you're looking for a great outdoor wok burner starter kit, this is the right product for you. 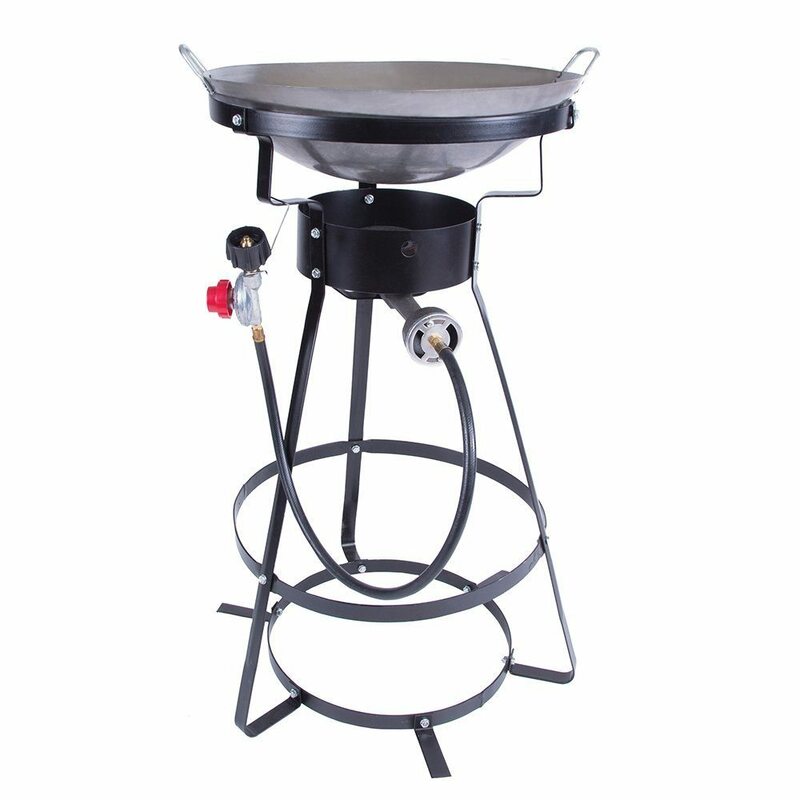 The kit comes with a 24" bolt together stand that can fit a 18 inch wok in the recessed frame. Also, the kit comes with a stainless steel 18 inch wok and two wooden utensils that won't scrape away at your cookware. Need something that will really put out a lot of heat and power? This wok put's out 54,000 BTU, which is just the right amount of heat to successfully stir fry your favorite Asian meats and veggies. Also, never fear if things get a little messy outdoors. This wok burner comes with flame-proof wind guards to keep the heat from blowing off the top of your cooking and also to prevent fires from igniting. On top of that, the kit comes with a heat thermometer to make sure your meats are cooked through and your oils don't overheat. Overall, we love this wok burner set and know you and your family will enjoy it too! For those of you who've experimented with some wok cooking, you may realize that cooking indoors can be pretty messy, stinky, and quite a hassle. If you're looking for the perfect way to transition your Asian cooking to the outdoors, look no further. 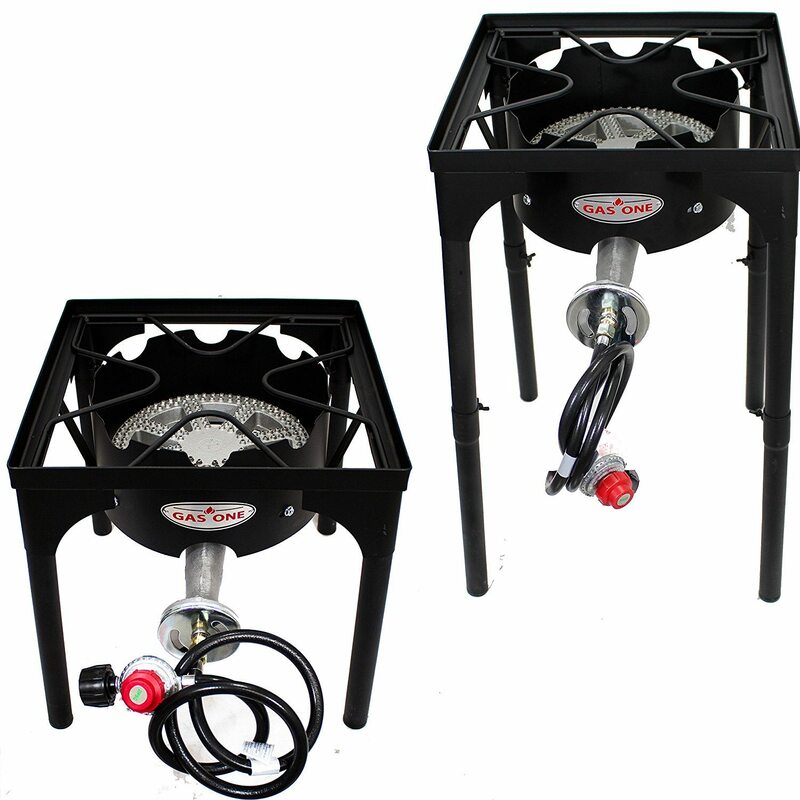 King Kooker is at it again, this time with a super durable and powerful 54,000 BTU propane outdoor wok burner. When it comes to durability, the iron cast frame is extra strong and can withstand some of the most brutal bumps and scratches. ​What makes this burner stand out from the others are the attachable interlocking legs. These allow ultimate stability even for uneven surface if you're cooking in your backyard. Also, for those of you who love deep fried anything, this kit includes a deep fry thermometer to ensure that your oils are at the perfect temperature to get a crispy golden finish. In addition, there is a flame-proof wind protector that surrounds the wok to ensure an even cook to your favorite dishes. Planning a fun outdoor camping trip for the summer and want to bring along some of your favorite Asian cuisines? 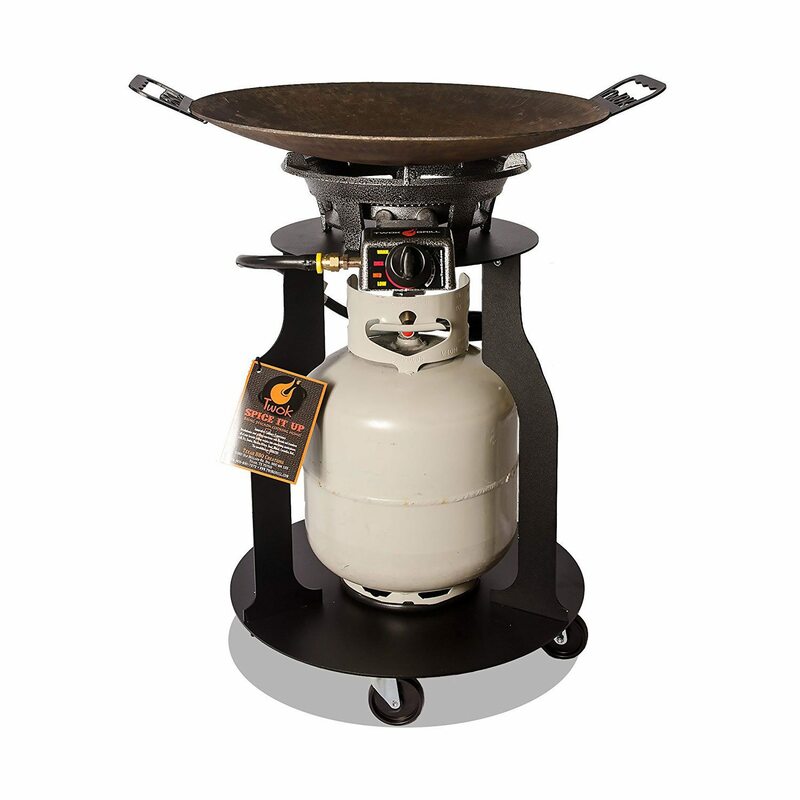 Now you can with this incredible Laguna Grills disk cooker. Although it may look different than your standard wok grill, the 24 inch disk is a huge cooking surface that is multifunctional and delivers some high-power cooking to all types of cuisines. Even though the BTU is half the power than most outdoor wok burners on the market, the flattened disk allows more surface area to heat and thus cooking the food you like much faster. If you are planning a big party and want to cook a little extra food, this burner can happily accommodate woks up to 26 inches in diameter. Also, we love the portability of this product. Weighing in at a total of 48 lbs wok included, the removable legs make it easy to store in the trunk for long camping trips or to bring over to a friend's barbecue.​ The strong steel frame is also resistant to dings and dents, so no need to worry about damage to this sturdy appliance. Avid campers, rejoice! This is the perfect outdoor wok kit that will change the way you eat on your adventures in nature. Utilizing 54,000 BTU of fury, this wok burner delivers some serious heat, allowing you to stir fry, broil, boil, or deep-fry your favorite Asian cuisines. You know how they say Super Man is the "Man of Steel?" Well, this is the wok of steel! The all-steel frame is basically indestructible, allowing you to bring your culinary skills even on the roughest of terrains. With up to 15 hours of burning time with a standard 20 lb propane tank, you'll never have to worry about bringing extra tanks on your trip or your flame burning out mid cooking time. Also, if you're a fan of deep-frying, this burner comes with a thermometer to ensure you cooking at the right frying temperatures. 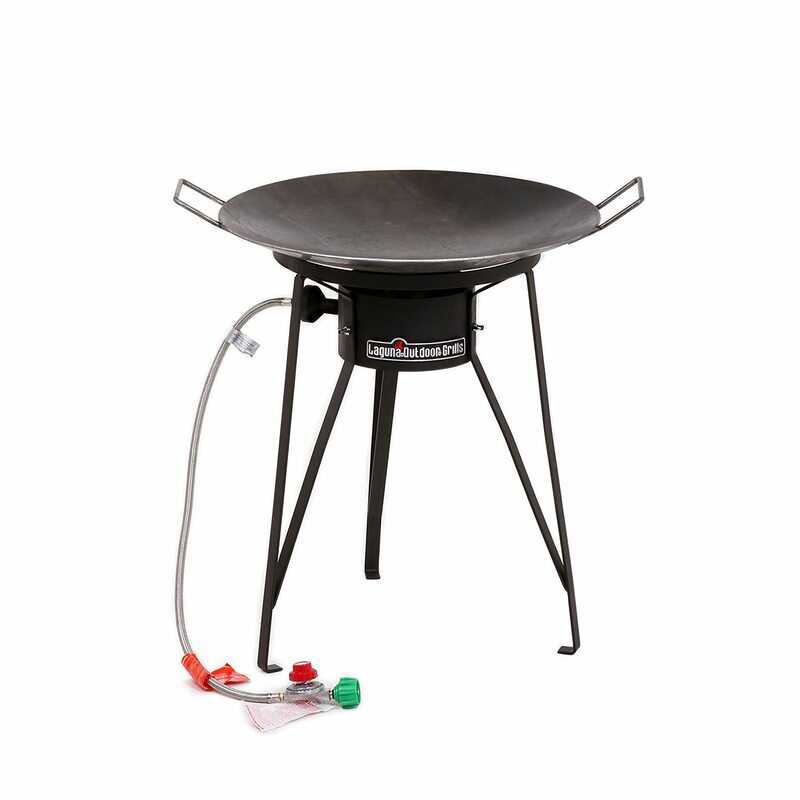 In the end, we love this outdoor wok burner because of its portability, versatility, and affordability. This is definitely a product to add to your outdoor culinary arsenal. Fans of Mexican food, we hereby alert you with some fantastic and exciting news. Woks are not only used for delicious Asian cooking, but they are also excellent stoves for cooking quesadillas, tortas, pupusas, and all other types of delicious latino cuisines. The Pancho Villa Wok Burner gives outdoor chefs a whole new latin cooking experience. One thing we absolutely love about this wok is its portability. The carbon steel legs are removable, making it easy to pack on long camping trips. Also, the burner comes with a 20 inch disk that allows you too cook huge amounts of food for the whole family. 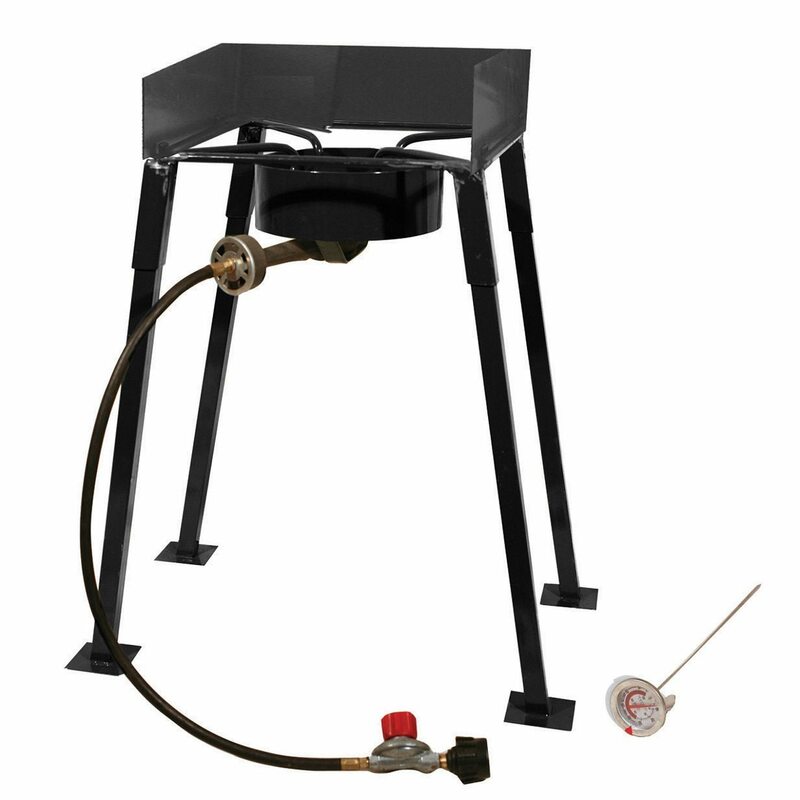 All the equipment is included to make your burner run smoothly including brackets and a gas line hose that connects to a standard 20 lb propane tank. If you're a fan of international cuisines, we know you'll absolutely love this wok. We highly recommend it for your next camping adventure with your family. For those of you who tend to be a little bit clumsy with their outdoor cookware (and believe me, we don't blame you) this is the perfect outdoor wok burner for you. Made with heavy-duty steel and a powder coat finish, this burner was built to last, Texas style. This beast of a wok burner deliver 55,000 BTU of heat to your wok, allowing you to stir-fry, deep-fry, and boil some of your favorite cuisines. Also, there's an easy to use temperature knob that states the heat from low-high. The beautiful 22 inch carbon steel wok disk is high quality and seasoned so you get every bit of flavor out of every cooking venture. On top of that, the frame comes with rubber castor wheels, making it easy to maneuver cooking from barbecue to dinner table. 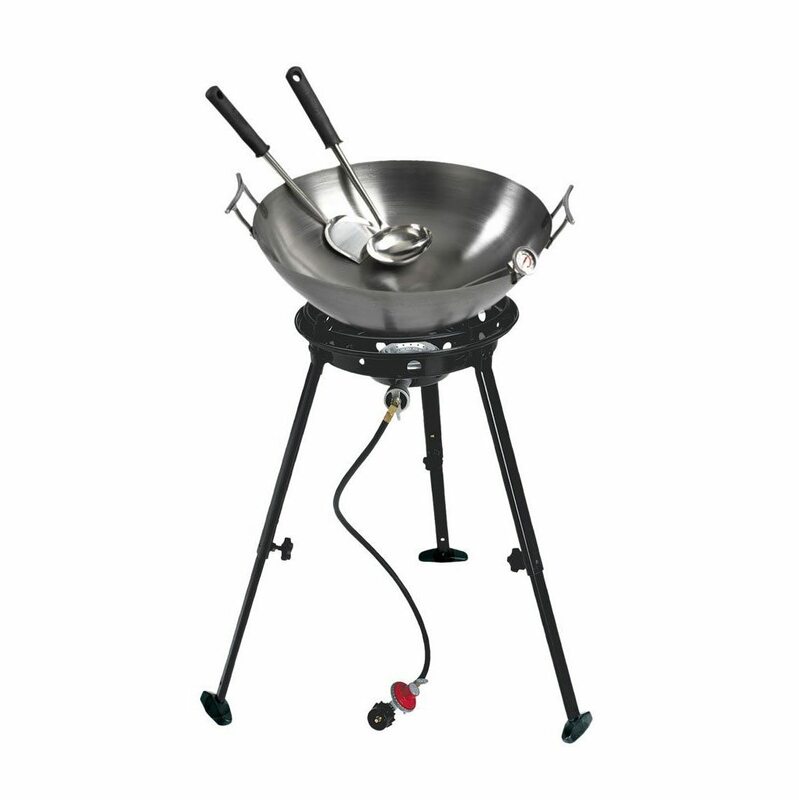 Overall, we love this wok burner for it's high heat, ease of use, portability, and incredible quality. We highly recommend this product for those who only want the best of the best. Everybody know's the phrase, "Size matters," but is it really true? In this case, I'd say, hell yeah! Except we're not really looking for something big, we want something handy and easy to put away (that's right). KitchenAid has done it yet again with a fantastic kitchen appliance that is not only effective, but also fits in any size cooking area. Running on 2 different speeds, this chopper makes it easy to manage the size of cuts you want to apply. You can do everything from dicing tomatoes and other vegetables to grinding nuts or making crust for pies. The two stacked blade technology works at an angle so the most surface area of the vegetables are sliced. Plus, all the dirty parts fit conveniently into the top shelf of your dishwasher, so you don't have to spend extra time scrubbing away.